Review: Set in 13th century England. Robin and his band of marauders set off to confront corruption in a local village. They lead an uprising against the crown that will forever change the balance of world power. 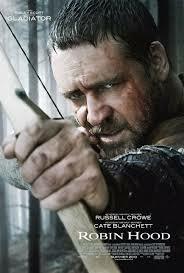 Disappointing film about the character Robin Hood. Can’t say much about Russell Crowe’s accent in this! I have heard that there were many changes to this film as to what Russell Crowe’s was going to do and what his character was going to be like. This is Ridley Scott and Russell Crowe’s fifth collaboration together. There was going to be a sequel to this but because it did so badly at the box office they canceled it. There have been many Robin Hood adaptations in the past. To name just a few are Prince of Thieves and also Men in Tights. I have to say that I was bored all the way through this and was expecting it to be much better.